Alternative energy is energy provided from sources other than the three fossil fuels: coal, oil, and natural gas. Alternative sources of energy include nuclear power, solar power, wind power, water power, and geothermal energy, among others. As of the beginning of the twenty-first century, fossil fuels (fuels formed over millions of years from the remains of plants and animals) provide more than 85 percent of the total energy used around the world. In the United States, two-thirds of the electricity is currently generated by burning fossil fuels like coal, gas, and oil. According to the U.S. Department of Energy and the Environmental Protection Agency, such combustion pumped almost 2.5 billion tons (2.3 billion metric tons) of carbon dioxide into the atmosphere in 1999. Over the last 150 years. some 270 billion tons (245 billion metric tons) of carbon in the form of carbon dioxide have been released into the air as a result of the burning of fossil fuels. Active solar heating: A solar energy system that uses pumps or fans to circulate heat captured from the Sun. Heat energy: The energy produced when two substances that have different temperatures are combined. 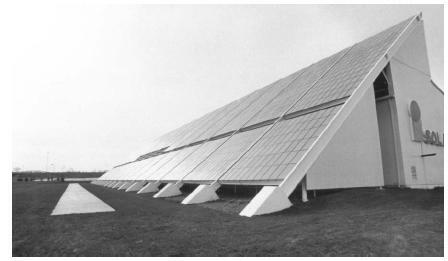 Passive solar heating: A solar energy system in which the heat of the Sun is captured, used, and stored by means of the design of a building and the materials from which it is made. Photovoltaic cell: A device made of silicon that converts sunlight into electricity. Solar collector: A device that absorbs sunlight and collects solar heat. Turbine: An engine that turns in a circular motion when force, such as moving water, is applied to its parts. Fossil fuels supply energy for transportation, industrial manufacturing, heating of buildings, and the production of electricity. However, the reserves of coal, oil, and natural gas are limited; in fact, they are called nonrenewable resources because once the supplies that are available are used up, they cannot be replaced. It is predicted that at the current rate of energy consumption, available reserves of oil and natural gas will be greatly decreased during the twenty-first century. Coal is more plentiful, but its use can contribute to environmental problems such as global warming (an increase in Earth's temperature over time). Because of growing energy demands in developing nations as well as the energy needs of industrialized societies, it will become increasingly necessary to turn to alternative sources of energy in the future. Conserving energy and using it more efficiently are additional ways of addressing the energy problem. Nuclear power is an alternative energy source that can be obtained from either the splitting of the nuclei of atoms (nuclear fission) or the combining of the nuclei of atoms (nuclear fusion). In either of these two reactions, great amounts of energy are released. Nuclear power plants use a device called a nuclear reactor in which uranium or plutonium atoms are split in controlled fission reactions. The heat energy released is captured and used to generate electricity. As of 2000, there were 110 operating nuclear power plants in the United States. France relies on nuclear power for more than 70 percent of its electricity production. Controlled nuclear fusion is believed by many scientists to be the ultimate solution to the world's energy problems. The energy released in fusion reactions is many times greater than that released in fission reactions. To date, however, the technology has not been developed to make use of this source of energy. Although nuclear power is a clean, cheap, and relatively safe means of providing energy, public concern over safety issues has brought the construction of new nuclear power plants to a virtual halt in the United States. The nuclear accidents at Three Mile Island in Pennsylvania in 1979 and at the Chernobyl nuclear power plant in Ukraine in 1986 (in which a large amount of radioactive material was released into the atmosphere) prompted fears of similar disasters occurring elsewhere. In addition, there is the problem of storing radioactive nuclear waste safely so that it does not pose a threat to humans or the environment. The power of moving water, or hydropower, is a clean and efficient means of generating electricity. Water falling through dams powers water turbines that are hooked up with electric generators. The energy is then distributed across vast electrical networks. Canada, the United States, and Brazil lead the world in hydroelectricity production. The building of dams has an environmental impact, however, causing flooding of land above the dams and disrupting the normal flow of water below them, which can affect the natural ecosystem (a community of organisms and their environment) of a river. and New York before 2020. By that year, the U.S. Department of Energy hopes the contribution of wind power to electrical generation nationwide will be increased by 5 percent. With new technologies being developed to improve windmill performance and efficiency, wind power is a promising, clean, cheap, and abundant source of energy for the future. Solar power, or energy from the Sun, is a free, abundant, and nonpolluting source of energy. Solar energy can be used to heat buildings and water and to produce electricity. However, the Sun does not always shine, and the process of collecting solar energy and storing it for use at night and on cloudy days is difficult and expensive. Solar energy systems can be either passive or active. In a passive solar heating system, a building captures and stores the Sun's heat because of the way it is designed, the materials it is made of, or the heat-absorbing structures it possesses. An example of a passive system is a building with large windows facing south (that allow sunlight to enter) and with thick walls that store heat and release it at night. energy of the Sun and converts it to heat for heating buildings and water. Flat-plate collectors are mounted to the roofs of buildings and used for space heating. They are made of a heat-absorbing plate, such as aluminum or copper, covered by glass or plastic. Water or air circulating in the collector absorbs heat from the plate and is carried to a heat storage tank. The stored heat is circulated or blown over cold rooms using pumps or fans. A conventional heating system is used as a backup when solar heat is not available. Solar heating of water is accomplished using a collector, a hot water storage tank, and a pump to circulate water. Sunlight can be captured and converted into electric power using solar cells (called photovoltaic cells). Solar cells are usually made up of silicon and can convert light to electric current. They are used in space satellites to provide electricity, as well as in watches and pocket calculators. Solar panels made up of solar cells have been installed in some homes, and solar cells are used as energy sources in lighthouses, boats, and other remote locations. Solar power plants—using energy from the Sun to produce steam for driving turbines to generate electricity—could potentially replace fuel-driven power plants, producing energy without any environmental hazards. In California, a solar power facility—using collectors made of large motorized mirrors that track the Sun—produces electricity to supplement the power needs of the Los Angeles utilities companies. Geothermal energy is the natural heat generated in the interior of Earth and released from volcanoes and hot springs or from geysers that shoot out heated water and steam. Reservoirs of hot water and steam under Earth's surface can be accessed by drilling through the rock layer. The naturally heated water can be used to heat buildings, while the steam can be used to generate electricity. Steam can also be produced by pumping cold water into rock that is heated by geothermal energy; such steam is then used to produce electric power. Geothermal energy is an important alternative energy source in areas of geothermal activity, including parts of the United States, Iceland, and Italy. Homes in Boise, Idaho, are heated using geothermal energy, as are most buildings in Iceland. The Geysers in California is the largest steam field in the world and has been used to produce electricity since 1960. Unlike solar energy and wind power, however, the use of geothermal energy has an environmental impact. Chemicals in the steam contribute to air pollution, and water mixed with the steam contains dissolved salts that can corrode pipes and harm aquatic ecosystems. The rise and fall of ocean tides contain enormous amounts of energy that can be captured to produce electricity. In order for tidal power to be effective, however, the difference in height between low and high tides needs to be at least 20 feet (6 meters), and there are only a few places in the world where this occurs. A tidal station works like a hydropower dam, with its turbines spinning as the tide flows through them in the mouths of bays or estuaries (an arm of the sea at the lower end of a river), generating electricity. By the end of the twentieth century, tidal power plants were in operation in France, Russia, Canada, and China. Ocean thermal energy uses the temperature change between the warmer surface waters and the colder depths to produce electrical power. Certain biomass (the sum total of living and dead plants, animals, and microorganisms in an area) can be used as fuel to produce heat energy. Wood, crops and crop waste, and wastes of plant, mineral, and animal matter are part of the biomass. The biomass contained in garbage can be burned to produce heat energy or can be allowed to decay and produce methane (natural gas). In western Europe, over 200 power plants burn rubbish to produce electricity. Methane can be converted to the liquid fuel methanol, and ethanol can be produced from fermentable crops such as sugar cane and sorghum. Adequate air pollution controls are necessary when biomass is burned to limit the release of carbon dioxide into the atmosphere. Other sources of alternative energy include hydrogen gas and fuel cells. Hydrogen gas is a potential source of fuel for automobiles, as well as a potential source of energy for heating buildings and generating electricity. Although hydrogen is not readily available, it can be produced by separating water into hydrogen and oxygen in a process called electrolysis. A disadvantage of using hydrogen gas as fuel is that it is highly flammable. Fuel cells are devices that produce electric power from the interaction of hydrogen and oxygen gases. They are used to provide electricity in spacecraft and are a potential alternative energy source for heating buildings and powering automobiles. Energy conservation plays an extremely important role in reducing unnecessary energy consumption. Improving energy efficiency is the best way to meet energy demands without adding to air and water pollution. Designing gas-saving automobiles, using fluorescent lightbulbs, recycling, raising the setting for house air conditioners, improving the efficiency of appliances, and properly insulating buildings are some of the ways energy can be conserved. Very good you really explained well on your research and backed it up thanks for the info! This is a great article and has taught me a lot about what we need to do for the future. 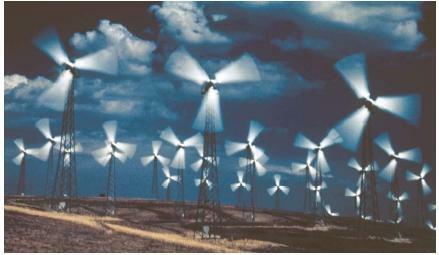 I THINK THIS REALLY EXPLAINS ABOUT ENERGY EVEN THOUGH I AM 13 IT REALLY BRAKES IT DOWN AND EXPLAIN ABOUT WINDMILLLS. I WAS ON THIS WEBSITE TO THINK OF A PROJECT TO BE IN A HOUSTON SCIENCE FAIR AND I THINK I HAVE FOUND MINE. this was a great article but i think you should add an article on Hydropower. thanks a lot! your article really helps me for my debate! Thanks alot for the information. I'm only 13 but this is really helping me for my science class. Your info has helped me a lot in my assignments. Your information is very useful and lists down the pros and cons of each alternative source. Finding good information like your website is SO rare nowadays (: Good job! it really help me on my project. i got all the info i needed.. thnxx!! .oh this is a nice article.it helped me a lot for my science project,i think we should conserve more energy so that the next generation can use it too.thanks a lot!!! which can be carried up to the reservoir and used to power turbines. than standard power plant with single ground level plants. this concept can use 1 or 2 levels to raise seawater to the dam through conveyors like scalators. please communicate with me kind people. cheers for this article! it really did help with my assignment. I didn't copy and paste anything what-so-ever. it really helped me in doing my project! :) thanks a lot! ! ! Great article! It was super helpful! I was glad to find this for my debate. Thank you for the information. This has allowed me to focus on the alternative energy sources and how they are used to support our energy grid. Very useful for a science project, thanks. I was worried about not getting the project correct. Great article, super helpful, it has help me to do my assignment successfully, thanks. please i would like to know the different recommendations of nuclear, fuel cells and thermal (coal/crude) alternative energy sources thank you. Can I please have the date of when this article was published? The whole idea behind alternative power sources is to keep carbon low. But does anyone take into account the carbon cost of Surveying, Developing, Mining, Refining. Manufacturing, Transporting, Supplying, Fitting these panels, batteries, wind generators and all the other numerous acts that cause pollution?